A school in Manchester has been criticised for not giving children enough time to eat at lunch. The Manchester school has come under fire after parents said children are not being given enough time at lunch to eat. Parents of pupils at Phillips High School in Whitefield said their children were told to throw their lunch in the bin so that other students could come in and sit in the canteen. Nicola Hall, a mum at the school, said her daughter started coming home hungry since starting at the school in September. 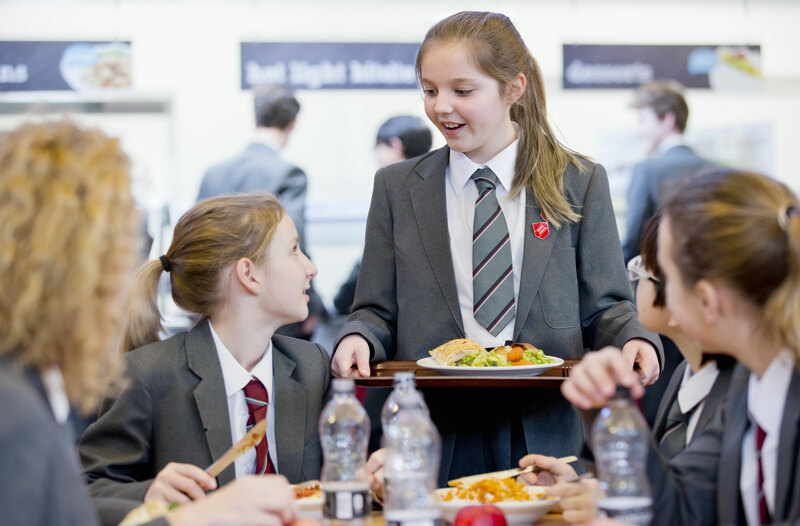 While the mum said that at first she put it down to an adaptation period, as her daughter started year 7, she started to get increasingly worried that her daughter was not eating at all because she came home ‘almost passing out and visibly shaking’. She told Manchester Evening News: ‘There’s half an hour for everyone in the school to get their food. ‘By the time the first bell has gone, they’ve put all their things in their form rooms, gone to the canteen and got back to the form room for the second bell, they’ve got 25 minutes at best to have something to eat. ‘Apparently a lot of the children are being told to put their packed lunch in the bin and leave. However, in a statement released by the school, headteacher Tina Owen said children had not been told to bin their lunch. The statement read: ‘Some of the pupils did not queue correctly or follow the systems shown to them which meant the lunch was slower than normal. ‘Pupils are NEVER told to throw food away and are most definitely NOT told they cannot have lunch. ‘We have held an assembly to reinforce the systems and resolve any issues. This is normal practice. Did you ever have a similar situation at your children’s school? Head over to our Facebook page and let us know your thoughts!